Orange juice, lime juice, tropical fruit drink mix and crushed ice create a frosty, slushy blender drink that's ideal for any summer party. Place drink mix, water, orange juice and lime juice in blender container; cover. Blend on high speed until drink mix is dissolved. Add ice; blend until smooth. 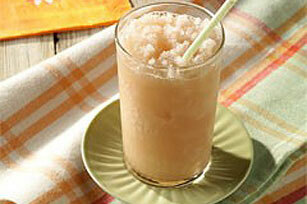 Substitute CRYSTAL LIGHT Strawberry Orange Banana Flavor Drink Mix for strawberry kiwi drink mix.